Welcome to my web page, it's all about the herb Sage! Sage is a very interesting herb that is widely known for its common use in cooking. Throughout history, people have been cooking with sage and other aromatic herbs to enhance flavor. But flavor enhancement only scratches the surface of what sage has and can be used for. Sage is considered to have medicinal properties and is used to cure common ailments such as sore throats and mouth irritations, and it is used to clean cuts. It has even been thought to be a mood enhancer and able to help with concentration and memory. In fact its name Salvia officinalis eludes to its medicinal properties. 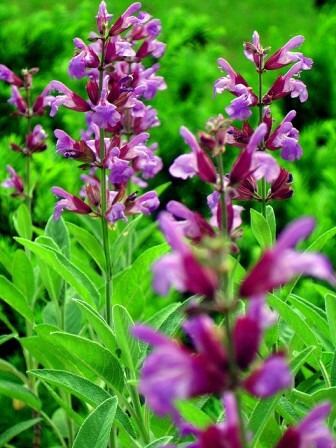 Salvia stems from the Latin word salvere, which translated means to save or to care. In addition, the word officinalis is translated as medical. If you are unconvinced that sage is an amazing plant, continue on and let the research convince you how interesting and useful this herb can be. The image found on the top of each page is by H. Zell on Wikimedia Commons. Click here to see the original picture. To see common ancestors of sage and classification, visit Classification. To check out more awesome organisms, visit the Multiple Organisms website.